When I lived at home with my parents, one of the people in the neighborhood would walk their dog every night, and I always remember being enchanted by the large fluffy dog. My husband and I have two children and their safety was the utmost concern when deciding on a dog. The dog is a family member, and I refused to bring anyone into the house if I knew they had a tendancy toward aggressiveness with children. I grew up with border collies, and loved them. I knew how capable they were, and intelligent. 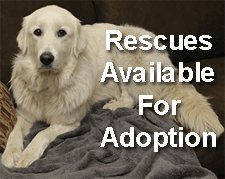 When I looked here in our local shelter, a sweet face came across the screen and her name was Jane. She was a Great Pyr, and she looked so sad in her cage. I read more about the breed and realized that was the enchanting dog that I always saw and had fallen in love with when I was younger. I looked over the rescue sites and Jane kept popping up here and there. My husband knew how badly I needed to fill the empty, dog shaped space in our family and sugggested going to the Humane Society to have a look. I went right for the big dog sectionm because I knew, Jane being a Great Pyr, would probably be there, but to my dismay she wasnt, and my heard sank. We went over to the smaller dogs just to have a look and half way down the kennel on the right I spotted a mass of white. "It's Jane!" I said so happy! 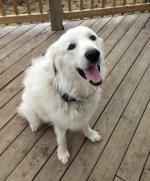 "She's a Pyr!" I told my husband so excitedly!! 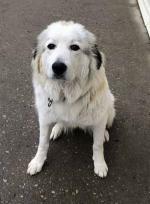 Come to find out Jane, was heartworm positive, and there was a long missive posted on her kennel about how she was a Pyr and she was this kind of dog and that kind of dog and they were going to be very specific as to who adopted her. The anxiety welled up in me. They dont usualy adopt heartworm positive dogs to families that have small children because they cannot be excited, but we decided to ask for a visit with her any way. There were a few people in line before us, and we waited, sitting on the floor in front of her cage, rubbing her ears through the fencing. Our time finally came to visit with her and we were escorted to the outdoor pens, and the guide brought her out to us. She was fairly aloof, almost like she was just going through the motions. We knew we loved her the moment we saw her. She regarded us with least concern, but did go out of her way to lick the baby, who is 18 months, as she babbled away to the dog. The girl went over her treatments for the heartworm, and that she is about 20 lbs underweight. That she is a special needs dog, and we had the option to foster her untill she has her last treatment for the heartworms which will be on 06/02/14. We had only intended on looking and brought our small car with two car seats and no room for a large dog, so we said we would go home and do some shopping to get the house ready for her, and that we would be back in the morning to take her home. I spent the next night unable to sleep because I hated that she was stuck in a cage still. The next morning husband went to work, and the smallest child and I went to the shelter to get our girl. They took our leash and collar that we bought for her and brought her out to us. I called to her "Hey girl!" and she fell at our feet, tail wagging, pressing herself into me. She did the same thing to my 4 year old when she got home and saw her for the first time. She has been home for two days now and I already love this dog like she were one of my kids, because she is. She needs some TLC, and lots of food, but she is going to be worth every penny spent and every moment taken up. She gets to spend the rest of her days with us as a family, with little girls reading her stories and having tea parties, and being out of a cage and into a home. This dog is bursting with potential! I know she is going to be an amazing girl!!!! Comments for Alba, the new addition! You found each other and that is a happiness that no money can buy. I can hear so much love in your story with so much more to come. Enjoy your lives together with your dream dog. 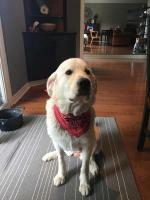 Pyrs are the best dogs ever. 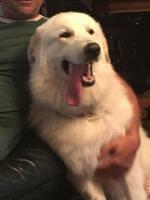 Well you've been bitten by the Pyr bug! It is worse than being bit by a vampire! Vampires only want your blood but a pyre! A pyre will take your heart and soul and you will give it easily. That's when you find out they are not your normal dog. Some one once said I wish I could be the person my dog thinks I am. When it comes to a pyre I say I wish I could be Half the person he is. Pyres are your best friend, best baby sitter, best confident, your hero and protector. Pyres keep your biggest secret and by the way everybody in your home is completely sure he loves them best. When your friends see him they say how beautiful your monster is but know they could never maintain him. You walk away wondering how they can't tell what a small price that is to pay to own one of these majestic babies. Other people are attracted to one breed or another and you swear it is only because they never had a pyre. You realize that black wasn't your favorite color and you don't even miss wearing black since it is not as slimming as walking your big white fluffy dog. The only thing better than your first pyre is every other one you get. You can't understand how the next one can be as special as the last one that was the greatest friend you ever had and that is the true mystery of the world. So I say VIVA LA GRAND PYRENEES. NOT JUST A DOG AT ALL. How fine that you and Jane have connected and she has a home. You don't mention what her approximate age is but if she is young, less that 24 months, you may have to deal with some adolescent checking of boundaries. If you need help, ask us here on the site. These comments almost made me cry! Her new name is Alba, I realized after I submitted the story that she has left the kennel name of Jane behind, and we named her Alba, after my husband's home country, and its the word for white in latin. She is 3 years old, and has spent every day getting closer to us. She really has won over our hearts and minds, and done so in such a quick time it is amazing. It's like we have always loved, her we just didn't know it yet! I just love your story. Isn't it strange how it only takes one look at this wonderful breed and you're hooked for life! I understand completely how you love your Alba. She will love you as much as you love her. And I pray that her heartworm medication is good to her. That pyr takes your soul along with your heart. My pyr is my son. Very much so. I am so happy your family becomes Alba's family. 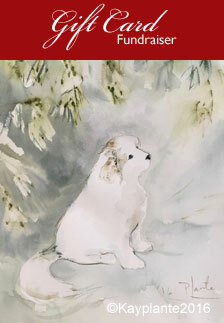 I wish this for every pyr breed if possible for they are truly a wonderful, wonderful species. 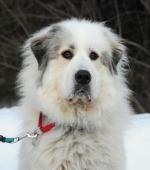 To be owned by a great Pyrenees is to be touched by the pyr love of this awesome breed. Good luck and wishing you many many cherished moments. What ever it takes... 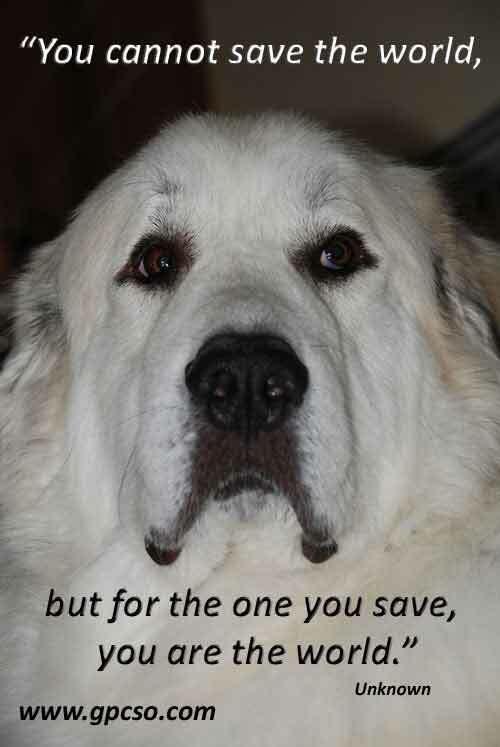 Remember your love for your pyr. The Dog who lives for only YOU! When a dog leans into you and sits on your foot (my adopted Mastino Napoletan) did the same. their are no words to describe the bond! I only had him for 3 short years but truth be told he is still all these years later one of my all time favorite experiences with dogs over 45 years. Escondino my Italian Mastiff was the "King of Dogs" and all of the Mastiff Breeds are the same. They give their all of their heart and they will give their life for you! They live for only their families.